31 July 2016, Sunday. 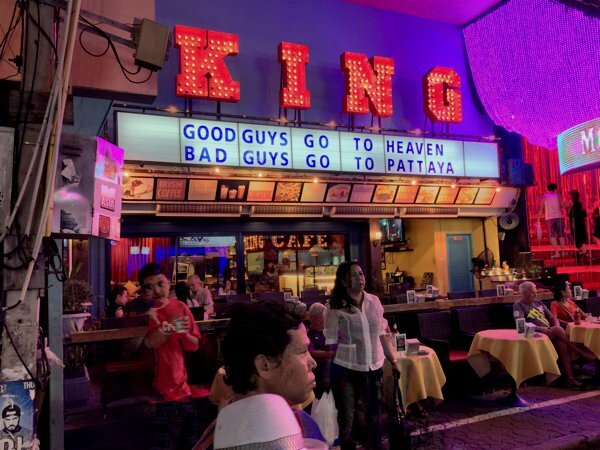 I strolled along the Walking Street of Pattaya last evening. It was very crowded and filled with both tourists and locals. The street seem to be an attraction in itself, and I saw multiple groups of tourists with their tour guides holding up a flag for easy identification of the tour group, lest the little hatchlings (aka tourists) get lost. 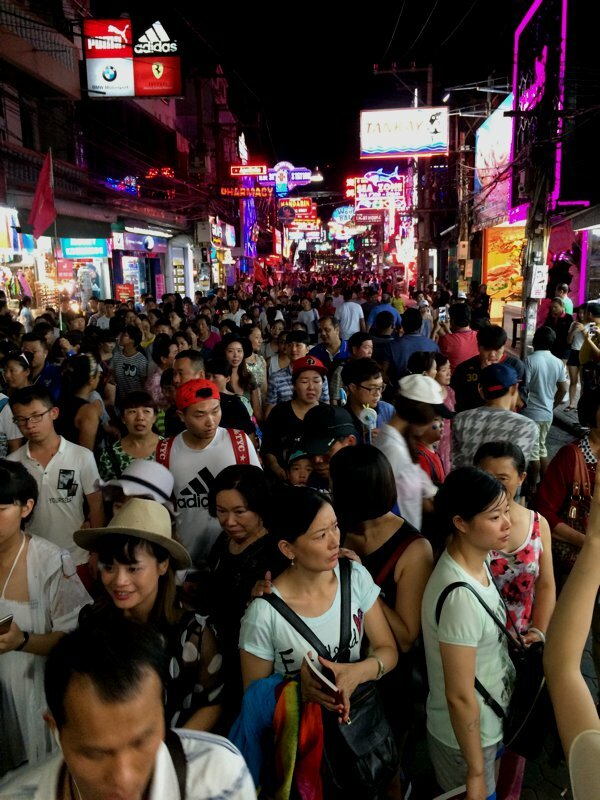 Walking Street in Pattaya was crowded! 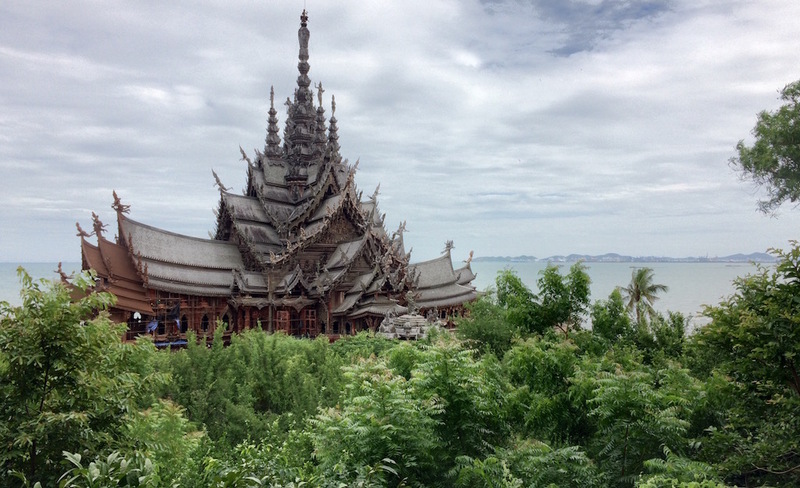 I headed to the Sanctuary of Truth in Pattaya in the morning. Model of the Sanctuary of Truth just outside the attraction. 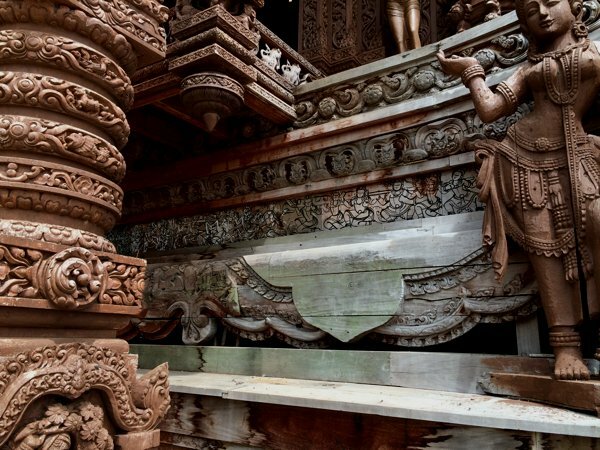 The Sanctuary of Truth is not a temple. 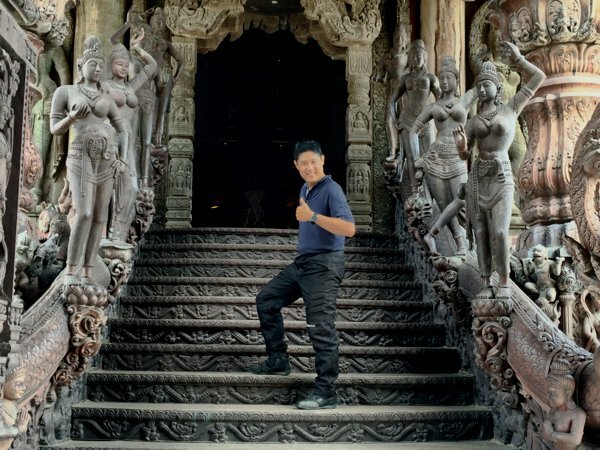 It is a privately-owned building (and land area) started by a Khun Lek – a wealthy businessman who used to be in the automotive import (Mercedes Benz) and insurance business. 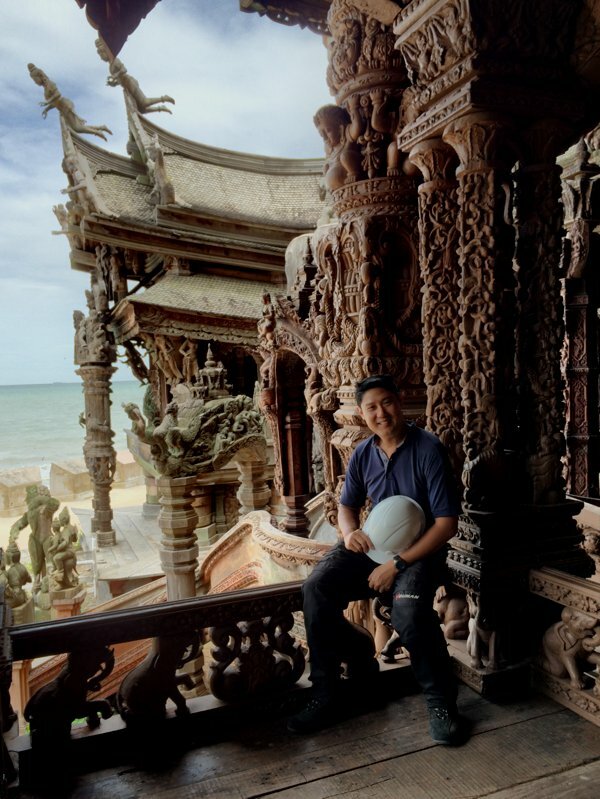 He started building the sanctuary in 1981 and it has been work-in-progress ever since. Like the Sagrada Familia in Barcelona, this building will likely be a work-in-progress for a very long time. 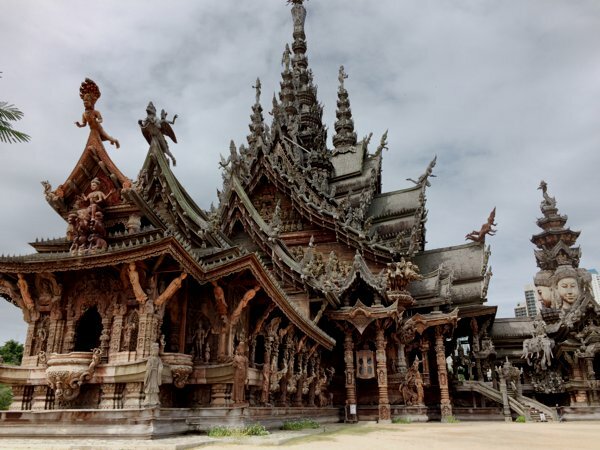 The entire building is made of wood. And the pieces of wood are joint using several wood techniques – butterfly joint, wooden dowels, wedge joint, tongue joints, and many others I cannot recall. No nails at all! 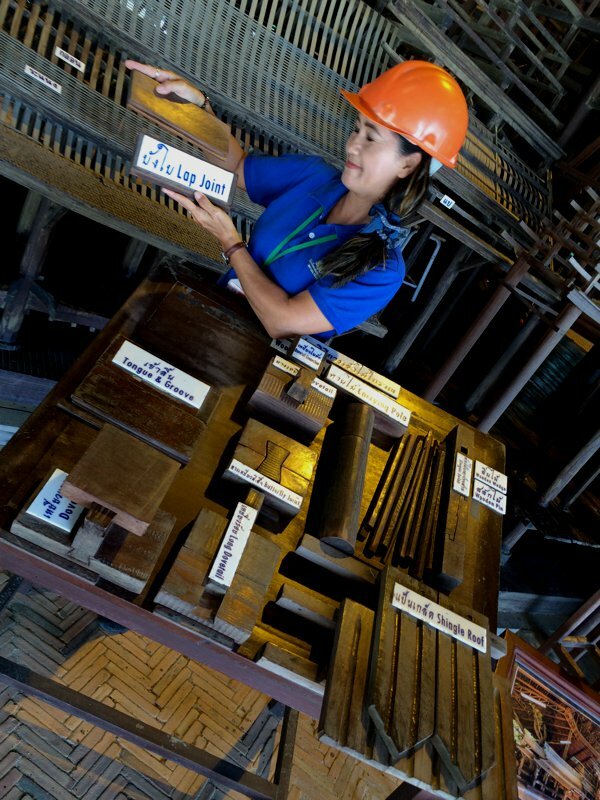 Metal nails are only used temporarily to hold pieces of wood together, and after the joints are made perfect, the metal nails are removed. Amazing! 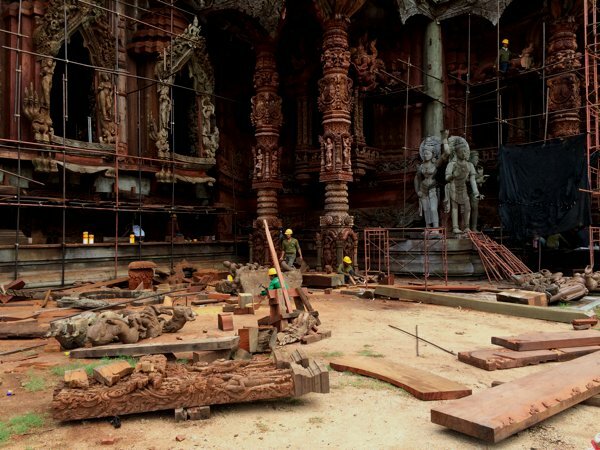 Many parts of the Sanctuary of Truth is still under construction. My english speaking guide showing me the various joint-techniques used. 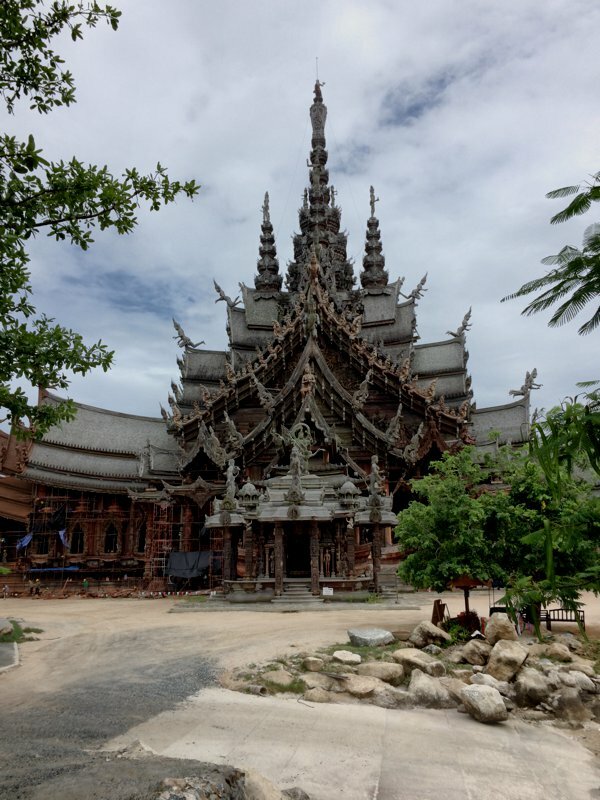 Woodworkers from Thailand, Myanmar and Laos work at the various wood carvings to be later installed inside or onto the Sanctuary of Truth. The completed woodwork (left side) and the uncompleted templates (middle). The templates will be replaced by the completed pieces when ready. View from the outside of the building. Everything’s wood! Amazing, huh? Even the staircase and handrails are made of wood! Probably gonna need quite alot of maintenance. 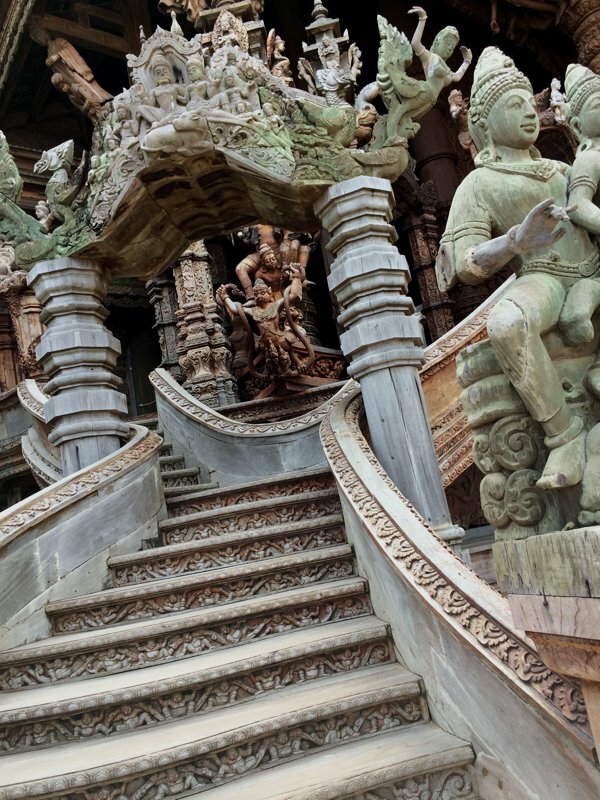 Check out the detail on the flights of stairs! 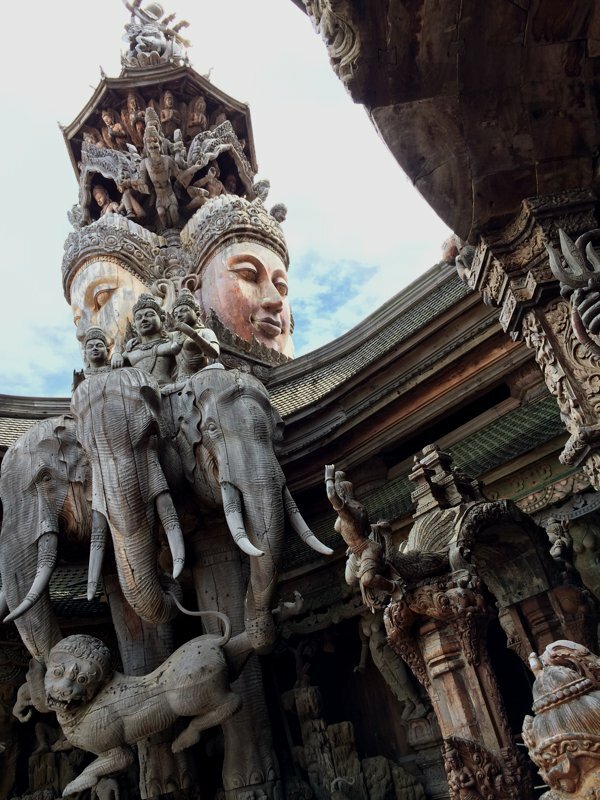 The Thais love their elephants! 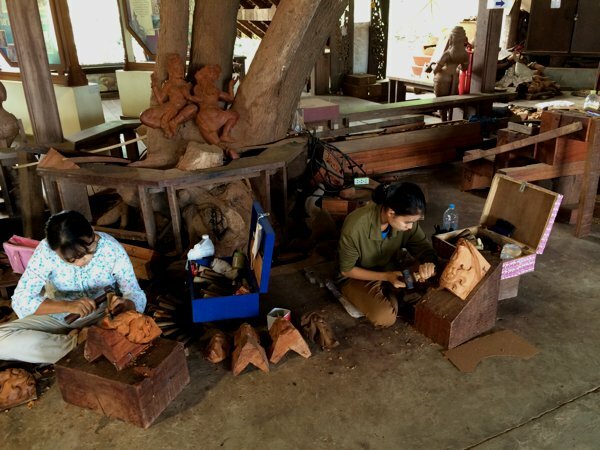 The designs of the wooden sculptures are inspired by Thai, Khmer, Chinese and Indian cultures. Sitting on the wooden balcony. Check out the angels on the roof top tips. Because part of the building is still under construction, Thai regulations require visitors (including staff) to don hard hats. 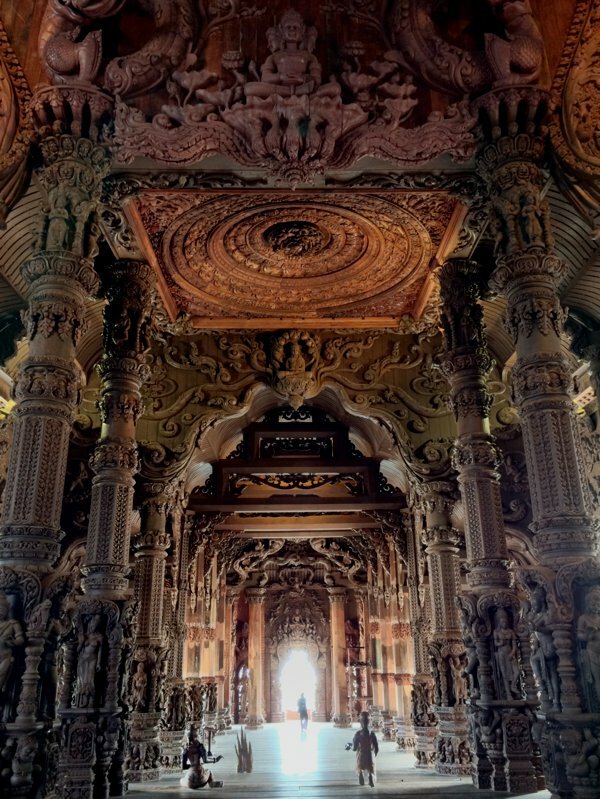 Inside the Sanctuary of Truth. That’s me surrounded by wooden ladies. This work indicates that humans are only dust in the universe and will ultimately become one with it. Physical beings deteriorate, ravaged by time, but truth and goodness are immortal. Materialistic pleasure is a superficial physical and external joy. 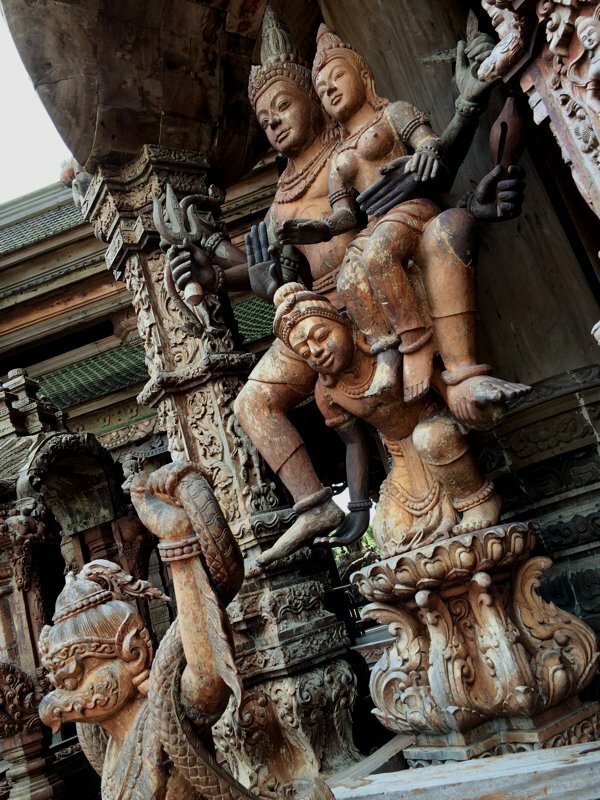 True happiness is found in intrinsic spiritual pleasure. Ideals make human life more meaningful. Determination to go to the ideal world is something desired by all men. To ponder the great questions of heaven and earth, and yet live for humanity, to study and teach the sublime knowledge of scholar of the past, and to create eternal peace for all mankind, this is the true goal and knowledge great men strive to achieve. – The writing on the wall in Sanctuary of Truth. I left Pattaya in the afternoon. 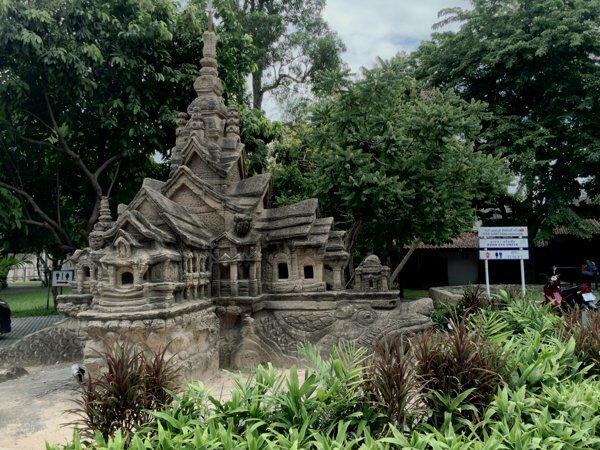 The initial plan was to head to Hua Hin. I thought I could use the beach to relax. I had planned to bypass Bangkok as I didn’t like the idea of getting stuck in the infamous Bangkok traffic jam. While travelling towards Bangkok (I had to bypass Bangkok to get to Hua Hin), I soon realised that the highways and main roads are OUT OF BOUNDS TO MOTORCYCLES! There is a arterial or what the Thais call, frontage road that runs parallel to the main road and highway. 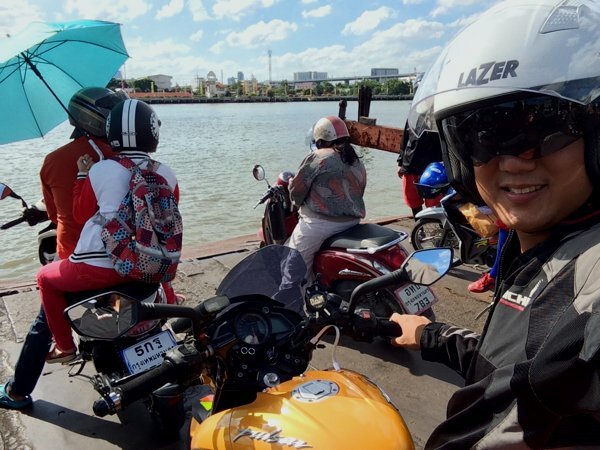 Motorcycles travelling on the highway or main road get a 5,000THB fine if caught. Okay no problem – just got to go a little slower to avoid the traffic and potholes. 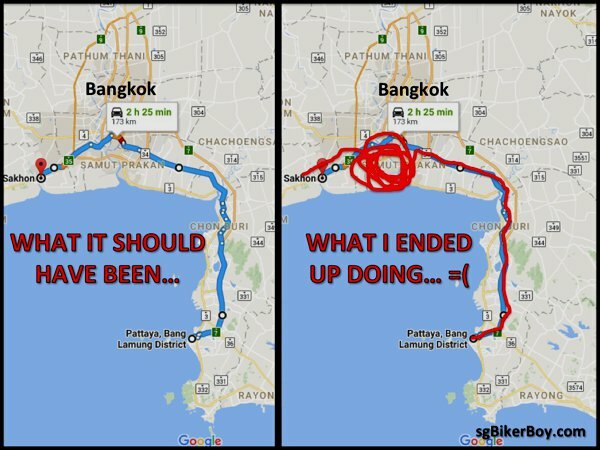 And then, somewhere near Bangkok, I got stuck in a jam. =( So bad that even motorcycles have a hard time passing through traffic. Then, my nightmare started. After getting stuck in a jam for about an hour (and being cooked in my riding jacket), I reached a bridge that’s out of bounds to motorcycles (trucks and trailers carrying construction material okay, though.) Arrrgh! So I looked for an alternative crossing. Punched it into my GPS and made the detour. And then…. the next bridge is ALSO out of bounds to motorcycles! WTF?!?! Okay, I’m officially stuck in a Bangkok maze. Exhausted, thirsty, and almost being cooked alive, I found a 7-11 and went inside for the air-conditioning and a cold drink. Inside, I tried asking for directions, but nobody spoke english. 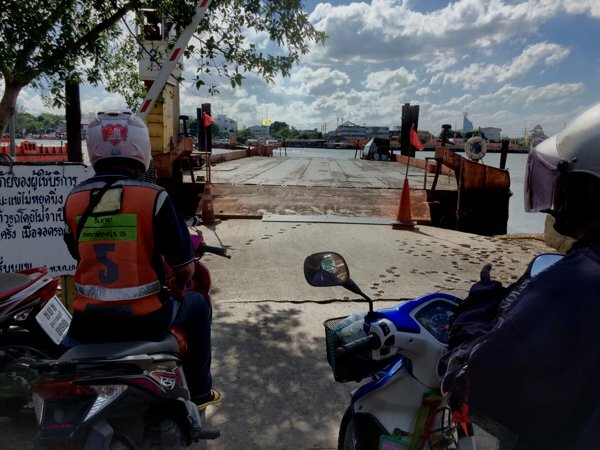 After some finger pointing and google-mapping, one of the counter girl finally understood that I was trying to head to Hua Hin on a motorcycle and am stuck here as I couldn’t cross the river. After some more gesturing around, the counter girl had a brilliant idea. She hailed a motorcycle taxi, gave the motor-taxi rider the instructions, and asked me to follow him. After 10mins and 20Baht, I reached a ferry point. “Motorcycle cross here.” the motor-taxi guy told me. Motorcycles cannot use the bridges. Motorcycles are banished to the ferries. 10Baht for the river crossing. sgBikerBoy and his Pulsar 200NS doing a river crossing. And by the time I got to the other side, motorcycles get banished into the arterial roads again. No highway for motorcycles. Arghh! The time was 5pm. My last meal was breakfast. I hadn’t had lunch. I was hungry, tired, and I didn’t have much daylight left. When I saw the world famous golden double arches from a distance, I turned in immediately and ordered a Big Mac meal. I got a room nearby after the meal. The sun’s setting, and I had a strict no travelling in the dark rule that I didn’t want to break – not especially when I’ve just battled the Bangkok jam hours earlier. I’ve concluded that Bangkok doesn’t like motorcycles. And for the purpose of this trip, I don’t like Bangkok too.